ISO 15189:2007 constitutes an international certification standard, based upon ISO/IEC 17025 and ISO 9001, which can be used by medical laboratories wishing to improve their quality standards. The requirements of this standard form a group of general guidelines that will help laboratories establish and enhance their quality systems. Although direct references to the use of computer systems are made in only 7 cases, through the mandatory section of the ISO 15189:2007, many more clauses of the standard include indirect references to electronic medical records handling. 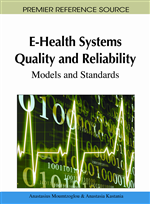 The chapter analyzes the guidelines concerning the use of laboratory information systems for medical records storage and retrieval. Furthermore, the authors discuss challenging difficulties that may be detected during implementation of ISO 15189:2007 in the field of electronic laboratory medical records. Laboratory automation has been propelled during the last 10 year by the advantages of greater productivity, lower cost and the capacity of integration with modern instrumental equipment, which connect to a laboratory intranet (Westbrook et al., 2008; Vacata et al., 2007). Laboratory information systems provide better functionality through automation in parts of the inspection procedures, permitting the lab to achieve maximum efficiency (Westbrook et al., 2008; Vacata et al, 2007). Laboratory information systems also improve service to physicians and other stakeholders and ultimately reduce the probability of human errors. It is widely accepted that error-prone activities can be substantially reduced, but not eliminated. However, information technology systems can provide reasonable, accurate, and reliable standardized procedures of quality control for the assessment procedure as well as sophisticated quality indices for all the control system of the medical laboratory (Westbrook et al., 2008; Vacata et al., 2007). Medical laboratory computers may be used in many ways. They may be used for preparing and administering the management handbook and standard operation procedures, for personnel training, for providing and archiving documents via intranet. The laboratory computers may also be used for creating customer databases, for evaluating test results, for connecting via the Internet with external sources of information and for contacting with customers, or as a typewriter. A computing system contains at least one computer, some peripheral devices and some software products. Moreover, computing systems operating parameters require custom verification and validation.